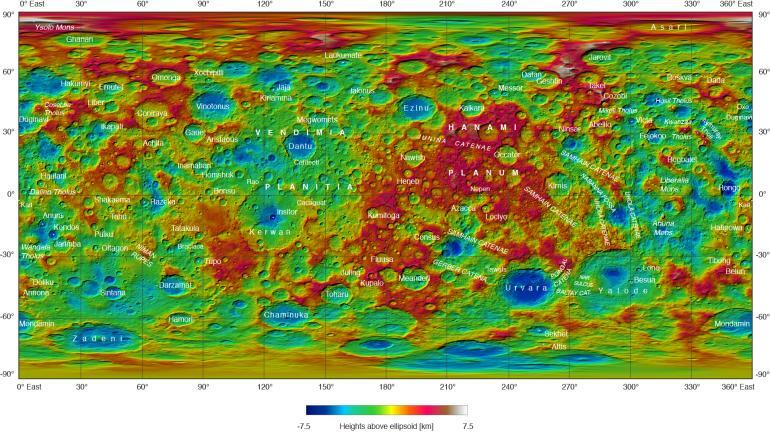 September 29, 2016 – This topographical map of Ceres, made with images from NASA’s Dawn spacecraft, shows all of the dwarf planet’s named features as of September 2016. Dawn celebrated nine years since launch on September 27, 2016. To date, more than 110 places on Ceres have been named. These include craters such as Occator Crater, home of the brightest areas on the dwarf planet, as well as crater chains called catenae, mountains such as Ahuna Mons, and other geological features. A full list of feature types and their definitions can be found here. Among the most recently named features is Kwanzaa Tholus, named after the African-American winter holiday Kwanzaa, which is based on ancient African harvest festivals. A tholus is a small dome-shaped mountain or hill. There are a total of seven tholi named on Ceres. The latest list of features on Ceres can be found at the USGS Planetary Nomenclature website.